Thai pomelos tend to be drier and less sweet than their American-available counterparts, but that shouldn't stop you from using them in a Thai-inspired salad nonetheless. Heck, even bitter grapefruit would make a great addition to this salad that combines fiery heat, bitterness, and sweetness in perfect balance. Pounding the garlic and chilies in a mortar and pestle releases much more flavor than any other method we've tested. Note: Thai red pepper flakes can be found in Asian markets. Alternatively, use a combination of 1 1/2 teaspoons red pepper flakes and 1/2 teaspoon powdered ancho chili. I strongly recommend using a good mortar and pestle for the dressing. 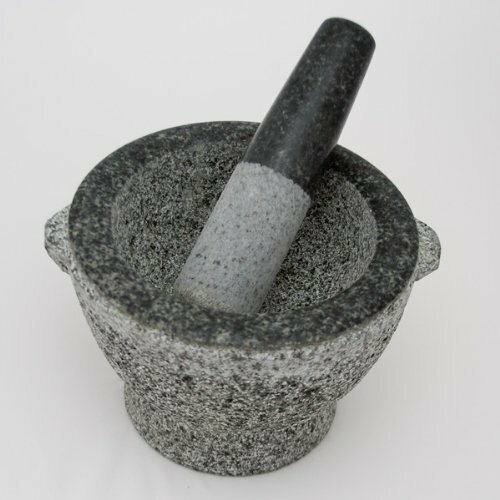 If you do not have a mortar and pestle, dressing can be made by combining garlic, pepper flakes, fresh chilies, brown sugar, fish sauce, and lime juice in a blender and blending until a rough purée is formed, scraping down sides as necessary. If pomelos are unavailable, a standard white (not ruby red or sweet) grapefruit can be used in its place. Bring a large pot of salted water to a boil. Meanwhile, Combine garlic, pepper flakes, and Thai chilies in a mortar and pestle and pound into a fine paste (see note). Add sugar, fish sauce, and lime juice, and pound until the sugar is dissolved. Taste dressing and add more sugar, fish sauce, lime juice, or pepper flakes to taste. It should be strongly spicy, sweet, salty, and acidic. Blanch beans in boiling water until bright green but still extremely crisp, about 1 minute. Drain and run under cold water to chill. Dry well on paper towels or in a salad spinner. Combine beans, zucchini, shallot, pomelo, mint, and dressing in a large bowl and toss to coat. Serve immediately.